I posted this printable a few years back, but wanted to bring it back out this year! For about 3 years or so we’ve been putting up a Jesse Tree in our home to help remind us of the true meaning of Christmas. The main Branch is a Biblical sign of the expected coming of the Messiah, Jesus Christ and the faithfulness of God. The other branches of the tree represent a piece of the stories that make up the whole story of God’s relationship with His people. As we read through the stories we see God’s people awaiting the coming of the Messiah. Similar to how we anxiously wait through each day of December in anticipation of celebrating the birth of our savior, Jesus Christ. Creating a Jesse Tree for your family is a fun, hands-on way to walk through the story of Jesus. As you read through the daily devotions, you’ll add an ornament to your tree. Each one representing the ancestors of Jesus and the events leading to Jesus’ birth. I created the Jesse Tree Advent Unit along with ornaments for our family to use with the study. The ornaments come in black and white so your kiddos can color their own ornaments, and full color if you prefer a ready-to-go pack! The download includes the Jesse Tree printable ornaments, as well as a daily reading schedule starting on December 1st and running through December 24th. Each day you will read the associated scripture for that day. Then have your kiddos color and hang the appropriate ornament on your Jesse Tree. Optional: Have students pick out one key verse from the day’s reading, and copy it onto the backside of that day’s ornament as a nice reminder. We normally use a small Christmas tree to hang our ornaments on, but you can use anything that works for your family. I’ve seen people create a tree silhouette with construction paper taped to the wall. Or you can even have your kiddos create a lapbook, and add the ornaments to that for a lasting keepsake! The download includes a cover page for a lapbook, or you can just use it as a fun coloring page! We also enjoy reading one of our favorite Christmas books, The Jesse Tree by Geraldine McCaughrean. Mr. Butterfield, the carpenter, has serious work to do – he’s carving a new Jesse tree inside the church. But a curious young boy wants to know what he’s doing, and is very persistent. In order to explain his carving, Mr. Butterfield begins retelling the great stories from the Bible that he knows and loves so much. As he does so, and in spite of his short temper, small miracles begin to happen. This colorful story goes so well with the Jesse Tree daily devotions in my download, so we read it as we go through the month of December! I hope you’re having a blessed holiday season! 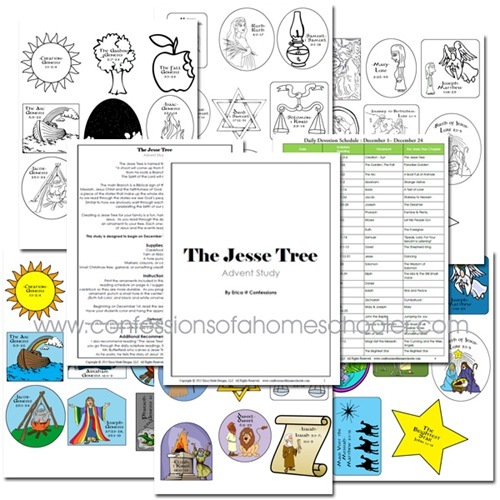 And I hope you enjoy the Free Jesse Tree download! Thank you so much for sharing these printables! What a servant heart you have! Blessings! I’ve been doing a Jesse Tree for the last few years now and I was pleasantly surprised to see your blog come up in my annual “Jesse Tree free printable” search. I’ve sent so many people to your blog for homeschool related printables and now I’ll have one more reason to rave about your site. Merry Christmas and Happy New Year! This really is such a blessing! Can’t believe you’ve given it away for free! Can’t wait to do this unit this Christmas with my boys. I know they’ll love it! Blessings in Christ!